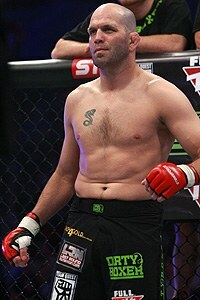 Olympic silver medalist Matt Lindland made an impressive UFC debut, beating “Mr. 200 Percent” Yoji Anjo by TKO in 2:57. Other TKO finishes included Fabiano Iha over Daiju Takase at 2:25; and the debuting Evan Tanner over Lance Gibson at 4:58. In a preliminary bout, future welterweight champion Matt Hughes lost to Dennis Hallman via submission to an armbar in 20 seconds. Two years earlier, Hallman had defeated Hughes in 17 seconds. Chuck Liddell also fought a prelim bout, defeating Jeff Monson by unanimous decision. One month after the show, the Fertitta brothers (Zuffa LLC) bought the UFC from Semaphore.